It wouldn't be 2018 in the housing market if there wasn't at least one report painting a gloomier picture. 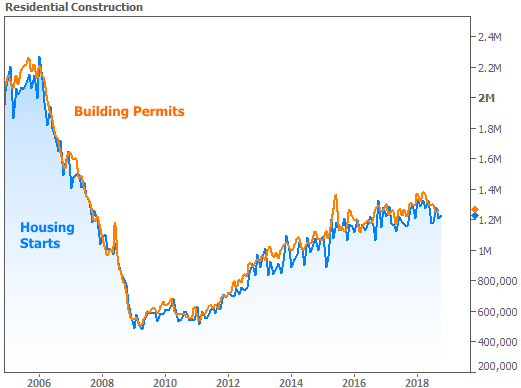 The National Association of Homebuilders Housing Market Index (or "builder confidence" for short) did those honors this week. Up until now, builder confidence had been holding up better than other housing metrics in 2018. That changed abruptly this week as confidence dropped to the lowest levels in more than 2 years, and at the fastest pace in more than 4 years. What's up with this sudden shift? Builders chalked it up, in large part, to recently higher rates and home prices. One other factor to consider is the psychological effect of sharp losses in the stock market. 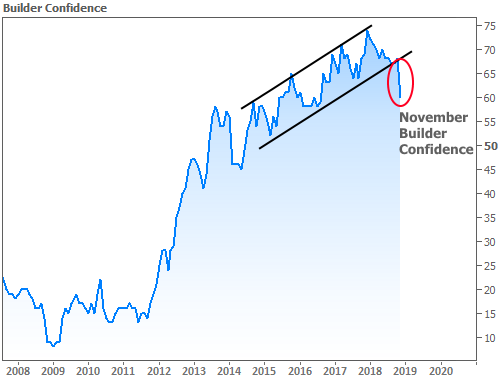 Builder confidence was the only downbeat housing report of the week though! Numbers were roughly as-expected elsewhere. This keeps longer-term trends in decent shape, especially with respect to residential construction numbers. 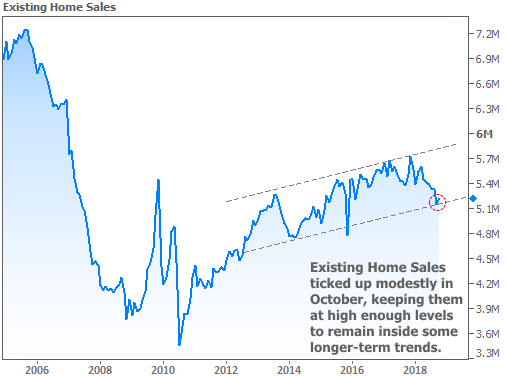 Existing Home Sales have fallen a bit more noticeably in 2018, but by bouncing here, they would be able to maintain a longer-term uptrend that began roughly 5 years ago. 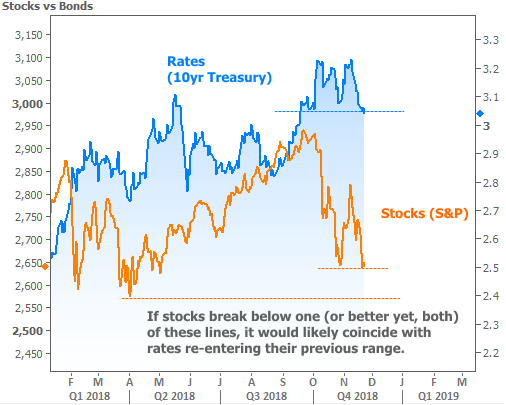 In terms of market movement this week, interest rates remained fairly flat while stocks continued lower. Incidentally, the builder confidence numbers (which don't tend to move markets) were shocking enough to cause a bit of a stir on Monday morning. 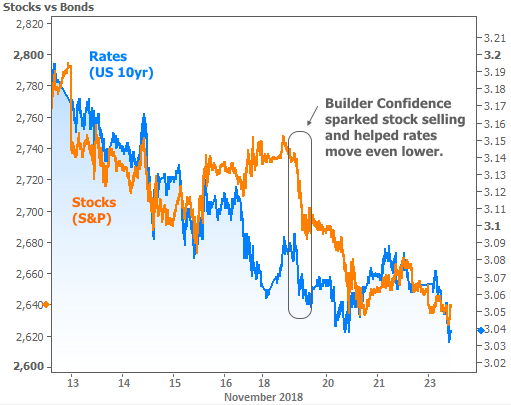 Simply put, rates might have moved higher this week had it not been for the builder confidence data setting the tone (it was the first and only economic report on Monday morning). In general though, it doesn't make much sense to read too much significance into Thanksgiving week market movement. As market participants return in greater numbers for the last few full weeks of the year, we'll be watching to see if stocks break below the key floors seen in the following chart. If they do, that could provide the inspiration for rates to continue lower. Helping families buy and refinance homes since 1996. I appreciate the opportunity to help manage your mortgage and financial needs not just today, but for a lifetime. Illinois Loan programs for buying your new home or refinancing with VA, VA IRRRL, FHA, FHA Streamline, and Conventional loans. Illinois Residential Mortgage Licensee MB.6760479.